The bi-radial matrix started from a study of gravitation as illustrated in the following diagram. "A diagram of a gravitational field surrounding a spherical mass M of uniform density is shown in diagram 1. The arrows show the direction of the field as everywhere inward. The spacing of the lines shows the field is strongest at the surface. For every point at the same distance from the center, the field intensity I has the same magnitude." Note: a spherical mass of uniform density does not exist in nature on a macroscopic scale. Thus this model can be considered an "ideal system"​. As the distance increases the field intensity decreases. As many radial lines as desired can be drawn to represent the field and they must be equally spaced. A greater number of rays corresponds to and is analogous to a greater mass and stronger gravitational field, and a smaller number of rays corresponds to a smaller mass and a weaker gravitational field. The bi-radial matrix began as an extension to this geometric analogy to represent two masses and their interacting gravitational fields as shown in diagram 2. The centers of the two "masses" generally designated as "poles" are indicated as "A and "B" separated by as distance "D". 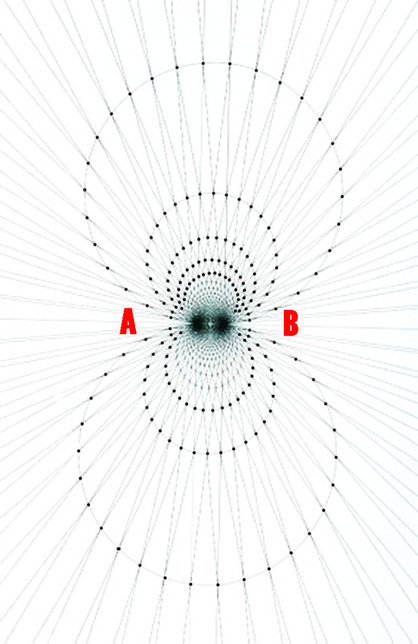 "A" also represents the number of rays from pole A and "B" represents the number of rays from pole "B". These represent the first three variables from which a detailed description of the bi-radial matrix is given. Upon further insights it turns out the bi-radial matrix represents something more fundamental than gravitation namely time and space. From the fundamental equation v=s/t it is known that space and time are two inseparable reciprocal aspects of motion. A detailed geometric analogy of time and space is pursued. Using geometric components to represent time and space fundamental force field structures are derived from first principles. In turn fundamental mathematical equations are derived from the structures This includes a fundamental inverse square law and the harmonic series. This is an example of quantum reconstruction and it amounts to trying to rebuild quantum theory from scratch based on a few simple principles. This also applies to gravitation as it attempts to rebuild macrocosmic theories of gravitation from scratch from basic fundamental principles. including the space time curvature of gravitational fields. The general inverse square law derived from an expanding sphere has wide spread application in physics. There is an increasing trend to pursue detailed, underlying and fundamental structures from which our physical laws will emerge as special cases. Some have in the case of the amplituhedron speculated that space and time are only a feature of the geometry. Our approach regards space and time as distinct entities albeit with geometric structure and a direct structural analogy to space and time is developed in pursuit of a commutative based quantum geometry. In devising his own quantum geometry Roger Penrose puts it this way: "My own view is that ultimately physical laws should find their most natural expression in terms of essentially combinatorial principles, that is to say, in terms of finite processes such as counting or other basically simple manipulative procedures..."
In line with this approach logically extending an existing geometric model of gravitation reveals detailed force field structures from first principles emerging from combinations of equi-spaced radial lines and angles. The reciprocal relation between space and time is described in experiential terms. A geometric and numerical analogy of space and time consistent with this property is logically derived. The "basically simple" mathematical relations are derived directly from the primary structure and physical interpretations are pursued. This is facilitated by using a bi-radial coordinate system and is in pursuit of a fundamental structure or structures and resulting fundamental equations of which our known physics equations are special cases. The bi-radial matrix is consistent with a background independent view of the universe. It is also consistent with time being primary and space being an emergent feature. Further research indicates a companion matrix which has the inverse properties. A broader aim of this research is to combine these two matrices with other similar matrices for a comprehensive integrated description of the space-time plenum in terms of finite processes, basically simple manipulative procedures and geometric structure. 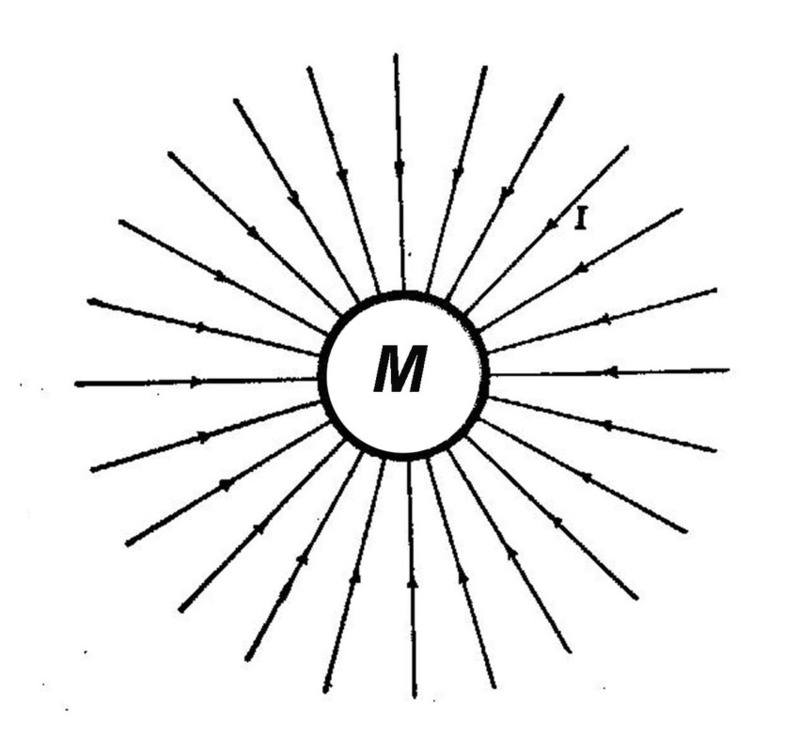 Diagram 1 depicts a gravitational field around a spherical mass M1 with uniform density. There can be as many or few lines as desired and they must be equi-spaced. As one researcher puts it: "The lines themselves are imaginary and do not actually exist; they are introduced as an aid to the understanding of gravitational forces and gravitational phenomenon." See part 3 sections 3-7. For every location at the same distance from the center the field intensity i has the same magnitude. This model partially agrees with observation. As objects fall they converge towards a common center of gravity. The spacing of the lines shows the field is strongest at the surface. In this analogy the greater number of equi-spaced lines corresponds to a greater mass and stronger gravitational field. Is there a way to extend this analogy to describe an inverse square relation between TWO masses and two interacting gravitational fields as described in Newton's law of gravitation? Note: The geometric analogy of a single gravitational field around a given mass such as the earth as well as any single point source which spreads its influence equally in all directions is explained using the surface of a sphere where the area of the spherical surface changes per the square of the radius. The field intensity I at any given radius r is the source strength divided by the area of the sphere. Note in this model the areas depicted are not physical quantities. It is only with physical interpretation that "force" and the quantity I is associated with this model. 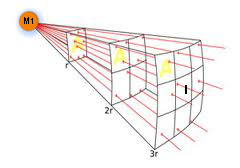 This inverse square being strictly geometrical applies to diverse phenomenon including point sources of light, radiation, sound and electric fields. ​ The BRM is similar only it applies to interacting fields from two point sources or bi-polar fields including magnetic fields and two interacting gravitational fields. See part 9, Section 13 on Newton's Superb Theorem. 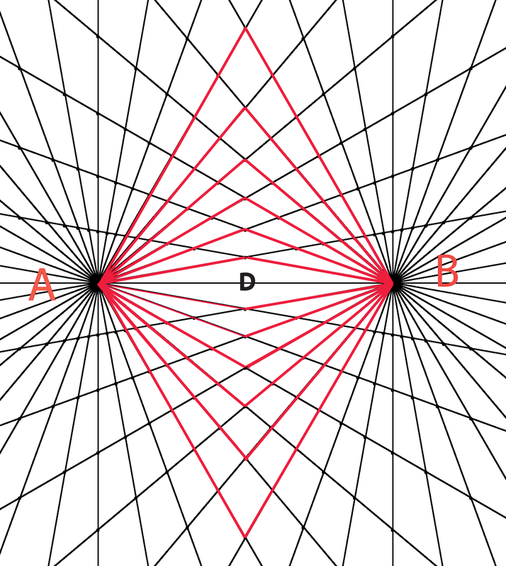 Two "masses" A and B separated by a distance D who's gravitational field interact forming nodes at the intersection of the rays. Before developing the mathematical quantitative relations qualitative properties of the geometrical structure are shown and a review of space time graphs and a bi-radial coordinate system is derived from first principles. Observe the trapezoids in diagrams 2 , 3 and 5 and the diamond shaped central region in each diagram. As the distance "D" between poles "A" and "B" decrease or increase the shapes of all the trapezoids and the diamond shape remain the same; i.e. the same internal angles, the same proportion in relation to surrounding trapezoids. This property of the BRM is "scale invariant" i.e. invariant under spatial transformation and will be explored further. It is easy from the initial variables to calculate all the interior angles of the trapezoids and show that all of them, per the principle of congruence remain the same shape regardless of the value of "D". From this we can prove the bi-radial matrix is scale invariant. See part 9, section 12 for comparison with conformal field theories. The trapezoid formulas are in the "Equations and Proofs" drop down menu of this web site. Review bi-radial coordinate system first. As gravitational fields relate to the geometry of space time a brief review of space time graphs is given. Section 3 Plotting and graphing space and time. Graphs such as that shown in diagram 4A are used to plot space-time relationships such as linear motion and acceleration. They are typically rectilinear Cartesian x-y axis oriented. In graphs like this linear motion results in a straight line graph where each segment represents a unit of space-time. It is revealing to use radial graphs to plot space time relationships. To show how the bi-radial matrix can be used to plot and graph space time relationships it is useful to develop a bi-radial coordinate system. First a brief survey a of polar coordinate system for graphing space time. Using a polar coordinate system where each ray marks the end of a unit time and the distance between the concentric circles represent unit space the graph of linear motion falls along the path of a spiral. Each segment along the spiral represents a unit of space-time. A bi-polar coordinate system can be used to plot space time. See part 3 section 3. Diagram 5 Both opposing sets of rays are numbered in opposite directions. 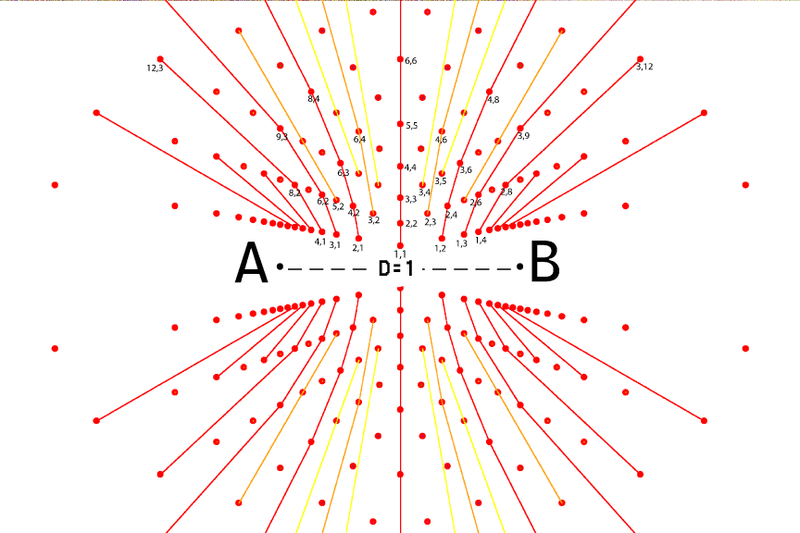 From diagram 2 as the two centers are opposite each other it is logical and revealing to number the sets of rays from each "pole" in opposite directions starting from the "D" segment. The geometry of the matrix is based on the phenomenon of angular displacement by discrete intervals. Where do we routinely observe and employ angular displacement indicated by discrete intervals? ﻿Time!﻿ Time has for millennium been revealed and regarded as angular displacement indicated by discrete quantized angular intervals since the advent of sun dials. Sun dials are based on rotational and orbital components of the Earth Sun system. This involves two reference systems. * The BRM reflects this. Without two reference systems pole A is only a time potential. Time is relational. 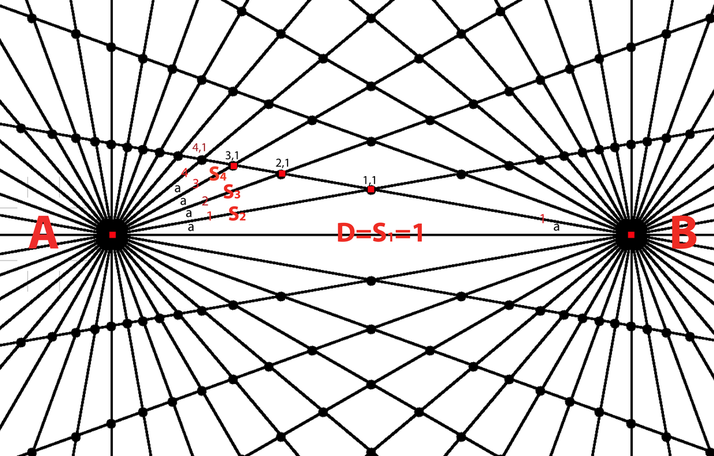 Upon the presence of a second time frame or potential, pole "B" the "space" between them, the "D" segment and the spatial sub-divisions along the rays defined by the nodes occurs. This precisely models the scenario where time is fundamental and space is emergent. See part 9 section 8. Time is still regarded as angular displacement defined by discrete intervals.The space-time relationship is clarified arriving at working definitions of space and time. After the bi-radial coordinate system is described space and time are graphed with the BRM similar to diagrams 4A and 4B. See section 3 part 3. Every 360 degrees of the Earth's rotation around it's axis is tantamount to saying 24 hours has elapsed. Hence every 15 degrees of the earth's rotation is tantamount to saying 1 hour has elapsed. Every 360 degrees of the Earths orbital displacement around the sun in tantamount to saying one year has elapsed. Time IS quantized angular displacement in any direction. A definition of space (s) and time (t) is implied in the definition of motion. The simplest form for an equation describing motion as defined for scientific and engineering purposes is v=s/t. This indicates that space and time are two reciprocal aspects of that motion and nothing else. If one train travels twice as fast as another it makes no difference if we say it travels twice as far in the same time or that it travels the same distance in half the time. This reciprocal relation between space and time has a numerical-mathematical and geometric expression using equi-spaced rays and angles. See part 9, sections 1-3. Are there definitions of time and space which are consistent with these reciprocal properties ? Time: quantized angular displacement in any direction. The variable "a" in section 7 diagram 7 below represents a "moment" or "quanta" of time the result of dividing the 360 degrees around pole A by any counting number. The variable "b" represents a moment or quanta of time the result of dividing the 360 degrees around pole B by any counting number. Note a quanta of time is a discrete unit of time. A quantum" of time would be the shortest possible duration of time whose value has yet to be determined. Space: quantized linear displacement in any direction See section 9 diagram 30. Both space and time are forms of displacement, one linear, the other angular. Space is progressive, time is cyclical. These definitions are corollaries of two fundamental postulates forming the basis of a comprehensive physical theory. See part 9 section 5. In diagram 5 each pole represents a separate time frame numbered in opposite directions per their opposing orientation and to allow for opposite time flow. Each number and corresponding ray marks the end of one discrete moment of time and the beginning of another like on clock faces. See Part 3, section 3. There is the primary space separating poles "A" and "B", the D segment and the spatial subdivisions along the rays defined by the nodes. Notice that the time intervals are unitized and the spatial intervals are non-unitized; integer vs real. This is a result of the reciprocal relation between space and time. Diagram 6 shows the intersection nodes from the two sets of equi-spaced rays from diagram 5.This is an interference pattern. Notice the non-uniform spacing between the nodes. The vertices are assigned coordinates based on the ray numbers assigned to the rays which create them. See diagram 7. Diagram 7 assigns bi-radial coordinates to the intersection nodes resulting from the interference pattern. Owing to the dense population of the nodes in certain regions not all the corresponding coordinates are legible. The coordinates are designated as (x,y) where x refers to the ray number from pole A and y refers to the ray number from pole B. 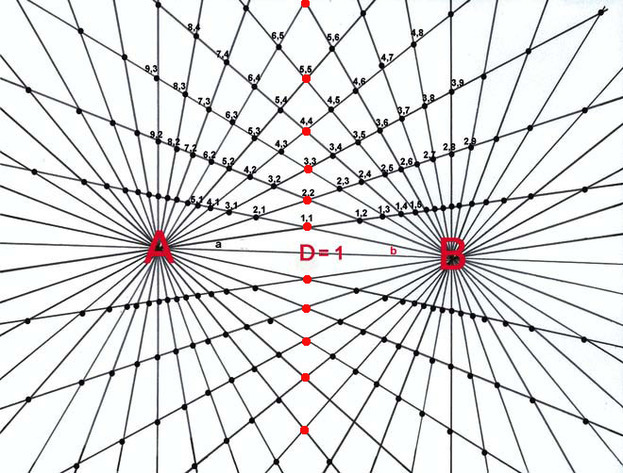 All nodes in any bi-radial matrix have coordinates except the A and B poles. Also recall from diagram 5a that if the pie sections were numbered instead of the lines between them the trapezoids would become the "coordinates". Note some times it is convenient to number the pie sections as they represent the discrete moments of time them selves as opposed to the imaginary lines separating them. In this case the trapezoids become the "coordinates" in the BRM. Diagram 7a shows a sample of the angular sections numbered and a random sample of the trapezoids with their resulting coordinate pairings. Section 1 Bi-radial "attraction lines" and connection algorithm. There are two primary algorithms by which to connect the nodes. Starting from the D segment and working outwards the shortest available path from "A" to "B" passing through unoccupied nodes. For example: A, (1,1), B and A, (35,35) B are the two shortest paths from A to B passing through unoccupied nodes. These form the inner diamond shape.The next two shortest paths from A to B passing through the unoccupied nodes are: A, (2,1), (1,2), B and A, (34,35), (35,34), B. Using this algorithm of "shortest distance between A and B through unoccupied nodes" to define the paths until all the nodes are occupied forms a familiar pattern. 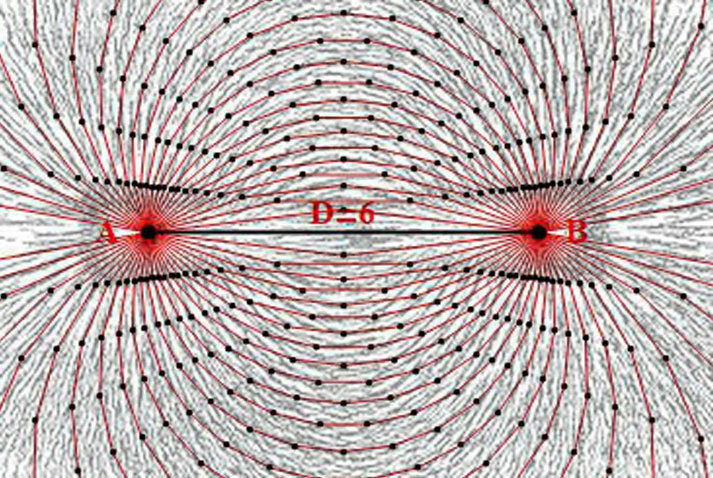 This is comparable to the attraction "lines of force" around a magnet as shown in diagram 9. 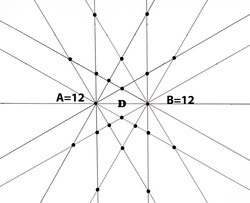 The bi-radial matrix represents an "ideal" condition giving rise to perfect symmetry. Actual magnets may have non-uniform density and other irregularities giving rise to slightly irregular field structure. In reference to gravitation the BRM represents two perfectly spherical masses with perfectly uniform density and (in the special case where A=B) of the exact same mass. This is not observed on the macroscopic scale. The bi-radial matrix is an ideal prototypical model indicating ideal conditions. Bi-Radial Structure of Magnetic Field. These are traces of magnetic attraction lines of force such as those observed by Faraday. From the results of the present investigation we can hypothesize that their underlying structure is bi-radial. 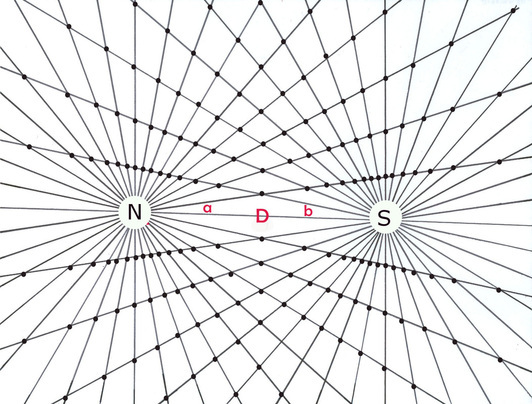 Diagram 10 highlights the bi-radial attraction lines from diagram 8 in red and superimposes them over traces of actual magnetic attraction lines with the same distance between the poles A,B and N,S. There is a structural similarity in both patterns. Are there mathematical similarities between the two patterns? This will be explored shortly. The end points of the segments (the nodes) which form the attraction lines in the BRM fall along the paths of non-concentric circles.The centers of these circles can be calculated based on the parameters in the matrix, See the "equations and proofs" drop down menu on this site. A change in distance D between the poles changes the scale of the non-concentric circles, not their relative proportions. A proportionate change in the ray numbers from each pole without a change in distance between the poles does not change the location or diameter of the circles, only the sampling rate within the BRM. See "Shell theorem" in Equations and proofs drop down menu for details. Continuing from diagrams 4a and 4b diagram 12 shows the space-time graph of the attraction lines where each ray marks the end of one moment of time and the beginning of the next. For example see segment ef. In relation to pole A it starts at the end of the first segment along ray 6 (6,1) and ends at the end of the second segment along ray 5, (5,2) . In relation to pole B it starts at the end of the 6th segment along ray 1 and ends at the end of the 5th segment along ray 2. In both reference frames segment ef represents a unit of space-time, only it's a different unit of space and time for each reference frame. Relative to pole A the segment ef represents outward motion in "reverse" time from moment 6 to moment 5. Relative to pole B segment ef represents outward motion in "forward" time from moment 1 to moment 2. This applies to all attraction segments and shows how this field structure is directly expressed in terms of space and time. Notice that neither space or time are curved, rather the paths of the attraction lines fall along curved paths (of circles). A similar graph for the repulsion lines indicates they can also be expressed directly in terms of space and time. (Not shown). The second primary connection mode is shown in diagram 13. The algorithm to determine the paths of the repulsion lines relates to the shortest distance only it refers to the vertical "V" axis which bisects the D segment. Starting from the poles A and B the paths through the unoccupied nodes which either include the vertical axis or are otherwise the shortest distance from the vertical (V) axis passing through the unoccupied nodes make up the repulsion lines. The resulting "repulsion field" is superimposed with the coordinates of the Bi-Radial Matrix. These are analogous to the "repulsion lines of force" between two like poles of opposing magnets as shown in diagram 14. Both these repulsion lines of force and the attraction lines of force in diagrams 9 have simple mathematical expressions within the bi-radial coordinate system. The BRM shows that the orientation of the repulsion lines are oriented about the V axis which in the special case of the BRM (when A=B) is perpendicular with respect to attraction lines who's symmetry is about the D axis. The bi-radial equations for the attraction and repulsion lines are shown in part 4, section 1. 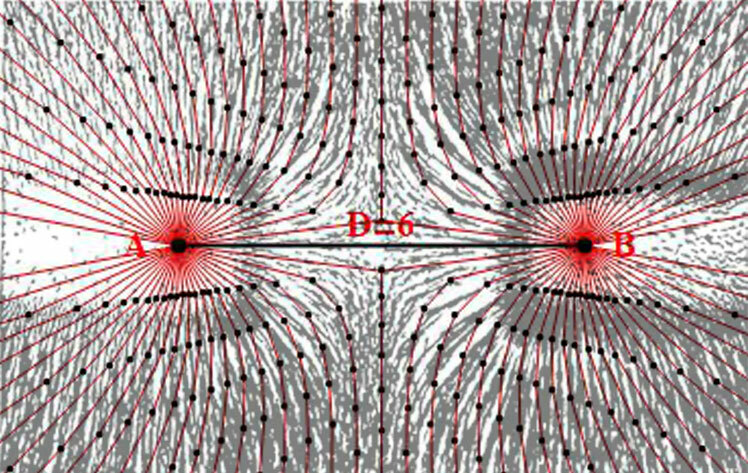 "Repulsion lines of force" between two like poles of opposing magnets. While the attraction lines are a cross section of a torus these repulsion lines of force represent a cross section of another 3-d form which is the antithesis of the torus. These contrasting forms generated by the field lines manifest as attraction and repulsion. We can also hypothesize that the underling structure of these repulsion lines are bi-radial. From the findings thus far it appears gravitation, and electromagnetism have the same underlying bi-radial structure. See part 5. Here diagram 15 shows the bi-radial repulsion lines from diagram 13 highlighted in red and superimposed with traces of magnetic repulsion lines revealing the structural similarities between the two. Are there mathematical similarities also? The hyperbolas in the upper hemisphere of the bi-radial matrix each pass through the coordinates which have a constant ratio. Part 4 Equations for the "lines of force"
From diagram 8 we can observe that the SUM of any bi-radial coordinates along a given attraction line is equal to a constant integer K. See the fifth layer for example where the set of bi-radial coordinates are: (5,1) (4,2) (3,3) (2,4) and (1,5). The sums of all these pairs being equal to 6. Also notice that in a bi-radial matrix where A=B. the equation x=y describes the set of nodes which runs perpendicular to and passes half way through the "D" segment. From diagram 13 we can observe that the DIFFERENCE of any bi-radial coordinates on a given repulsion line is equal to a constant. Taking the 4th layer from pole "A" as an example we see that the coordinates along this repulsion line are: (5,1) (6,2) (7,3) and (8,4). The difference between these coordinates all being equal to 4. Just as attraction and repulsion are opposite so to the equation for attraction is based on addition, and the equation for the repulsion lines is based on subtraction. From diagram 16 we can observe that in the upper hemisphere the RATIO or QUOTIENT of the coordinates along any given hyperbola is a constant. Notice that from equations 1,2 and 3 we can see that the fundamental field structures revealed in the bi-radial matrix are associated with the fundamental operators of addition, subtraction and division. This includes the well known attraction and repulsion fields. The hyperbola field to my knowledge has not been observed or investigated and is predicted by the bi-radial matrix. Note: diagram 1A shows a general inverse square law which applies to a wide range of phenomenon from gravity, radiation, electric fields, sound and virtually any single point source which spreads its influence equally in all directions. Diagram 17A extends this analogy to cover two point sources and highlights the interior radial segments where the number of rays from each pole A=36 and B=36. This model is a closer analogy to represent two significant gravitational masses. 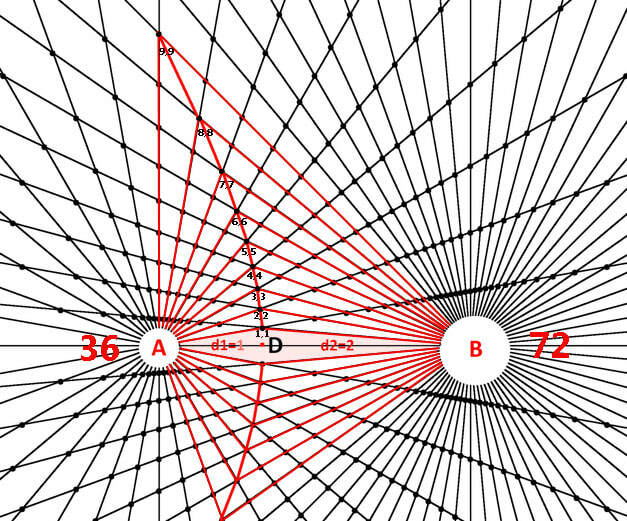 Like diagram 1A can the bi-radial symmetry describe a general inverse square relation over distance D? From there can this model be applied to various physical scenarios? Diagram 17B labels the interior angles and radial segments with variables for reference in the derivation of the following equations. Also the coordinates are labeled along the vertical axis. 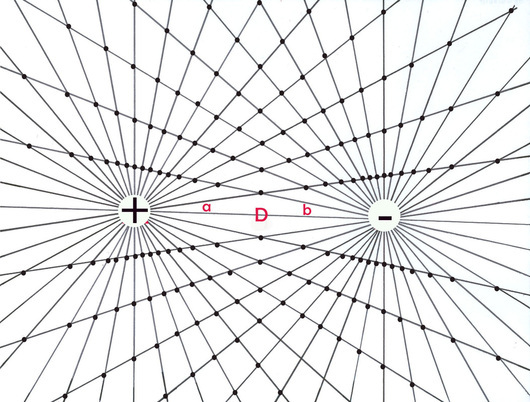 The equation for the vertical axis bisecting the D segment in diagram 17B where A = B. 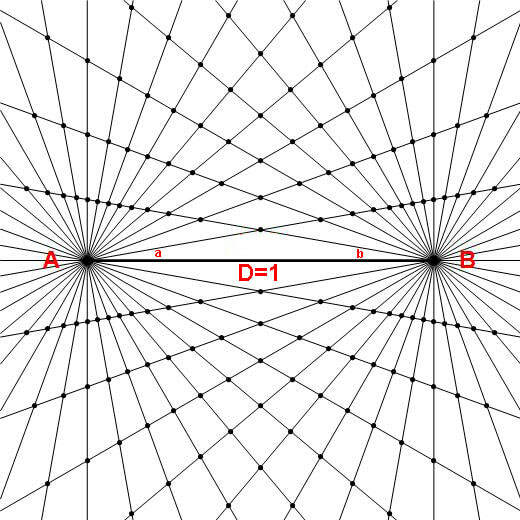 If A and B represent two equal masses the gravitational neutral zone would intersect the D segment half way between the two masses and the equi-potential line would run perpendicular to the D segment passing through this location. To broaden its applications BRM needs to describe interactions between two unequal sources. In the general case BRM the number of rays from each pole differs being analogous to two different sized masses for instance. See diagram 18A. The interior radial segments are highlighted in red. 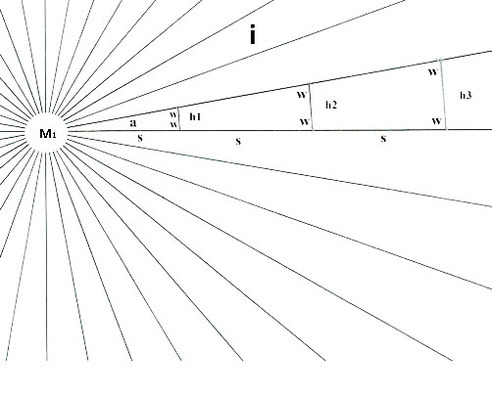 These and the resulting interior angles are labeled in diagram 18B. Diagram 18B shows the interior radial segments of the general case bi-radial matrix where the number of rays from each pole differs corresponding to two unequal masses, A=36 and B=72 rays. Compare this to the special case in diagram 17 above. An inverse square equation applying to both the special case diagram 17B and the general case in diagram 18B is derived from the variables summarized below. From diagram 18B the equation x=y for the general case bi-radial matrix yields a different path because the initial values of "A" and "B" are not equal. Hence the line defined by x=y is a curve which is biased toward the smaller mass and intersects the D segment at a location where the segments on either side are approximately in the same proportion as the two masses. In this case 2:1. See diagrams 20, 21 and 22. This is qualitatively similar to the gravitational equilibrium zone between two unequal masses. This phenomenon relates to the L1 Lagrangian point. It turns out there are a number of inverse square relations over distance "D" in the bi-radial matrix. To derive a bi-radial based inverse square equations based on distance "D" between "A and "B" the variables established thus far are summarized. See diagrams 17B and 18B. Having determined structural similarities between the bi-radial matrix and electromagnetic lines of force and gravitational neutral zone can mathematical similarities be revealed as well? Could a fundamental equation of which known force equations are a special case be derived directly from this underlying structure? What is the correct analogy within the bi-radial matrix that corresponds to the "force" term in the fundamental inverse square laws? Now Newton's law of gravity relates to the gravitational attraction between two masses. In the BRM this roughly corresponds to the pink shaded diamond region in diagrams 18A and 18B. 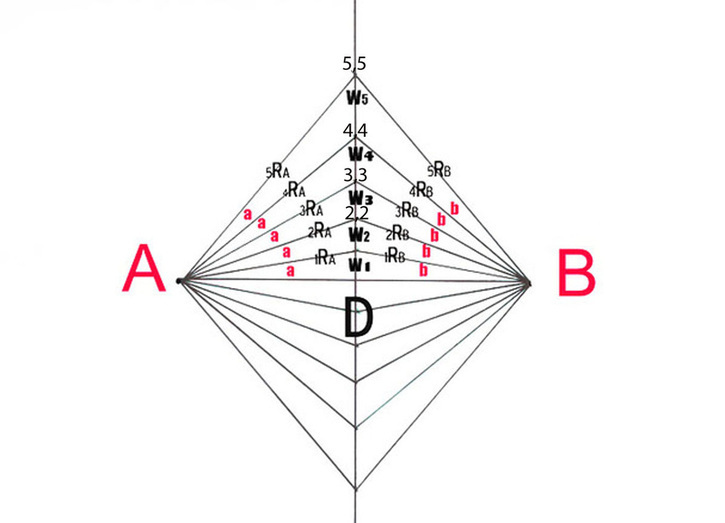 As the number of rays increase about each pole A and B while maintaining the same proportion, in this case 2:1 the diamond shape flattens out and approaches a line segment. aka the D segment The first bi-radial inverse square equation uses the law of cosines to describe this region. 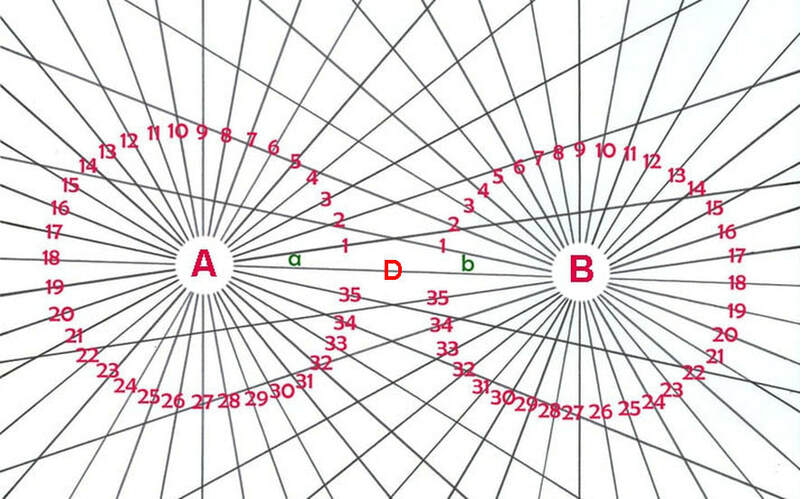 A= number of equi-spaced rays from pole "A"
B= number of equi-spaced rays from pole "B"
a= included angle around pole "A"
b=included angle around pole "B"
D= distance between "A" and "B"
NRA=length of Nth radial segment from pole "A"
NRB=length of Nth radial segment from pole "B"
Equation 11 is a bi-radial general inverse square based equation over distance which is comparable to the three known inverse square force equations and is derived from the underlying structure. Is this precisely analogous to the three force equations? There is a "1" on the left side , that is a constant where the three force terms are variables. On the other side there is a variable term where in the force equations there is a constant Equation 11 is derived from a portion of the matrix (the inner diamond shape) and therefore is not a complete mathematical description of the entire field structure. If this equation were to be analogous to the three force equations it would suggest that the three force equations are only a partial expressions of their related fields to which they apply. There are a number of other inverse square relationships over distance in the bi-radial matrix. More extensive equations are needed to describe the entire toroidal and counter toriodal field structures. This model suggests that force is a quantum interference pattern.The force equations each have a constant: G, A and K whereas in equation 11 there is a variable expression. This is curious in light of Dirac's variable gravitational constant. This also suggests a generalized equation which relates to all three forces. Also equation 11 contains both the sine and cosine functions which are wave functions. Does this indicate a wave function associated with gravity? Indeed the rotational displacement of time coupled with the linear displacement of space naturally forms a wave. This explains the underlying wave properties of the universe. In contrast the nodes concurrently exhibit the quantized particle properties of matter and force. What results does equation 11 yield when the length of the D segment approach zero or infinity coupled with variations in the ray count from both poles A and B? Also the "1" on the left side of equation 11 requires physical interpretation. The force terms in the three force equations represent various units of measure. If we regard (1) as "unity" and as being analogous to a generalized force term we can say that force is the uniting of two quantum potentials into (1) field. We speak of force fields. This implies that force IS a field with specific geometric forms, mainly that of a torus and counter torus. The (1) thus represents (1) force field, primarily attraction or repulsion. * The BRM has revealed a detailed geometric analogy to force. See part 9, section 3. The BRM to be a viable model needs to be consistent with known physical properties and to make predictions which can be tested experimentally. It is known that between two masses there is a gravitational equilibrium zone where the gravitation from each mass cancel each other. Diagrams 2, 6, 8, 17B and 18B show geometrical formations which are consistent with this observation. Equation 3 shown below shows the bi-radial equation for this region and it falls along the line where the value of the bi-radial coordinates are equal. See part 6, section 3 for a review of the bi-radial gravitational equilibrium zone testable hypothesis. When the two masses are equal it would be expected that the gravitational equilibriuml zone would be equidistant from the centers of the two masses and perpendicular to the (D) axis between their two centers. There is a set of nodes in the BRM which corresponds to this. 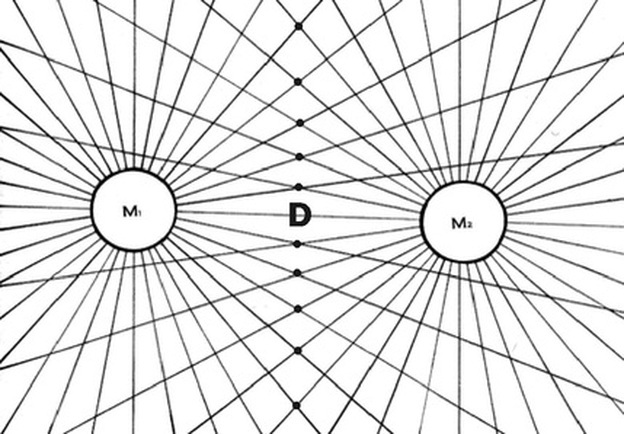 The gravitational equilibrium zone between two masses in an isolated two body system where A<B would be biased towards A and intersect the Dm segment closer to M1. 1) The gravitational neutral zone between two isolated masses "Am and "Bm" with a distance between their centers Dm corresponds to the path defined by the bi-radial equation x=y in a bi-radial matrix where the number of radial lines from each pole in the matrix "A" and "B" are proportionate to the two masses A1 and B1 where D is the distance between the two poles is equal to Dm. Note the bi-radial equation a=b can be converted to Cartesian and other coordinate systems. Examples of this are shown in "Equations and Proofs drop down menu. A scaled down version of the BRM can be used to make the prediction. This achieves correct results when A=B. The equation for the vertical axis bisecting the D segment in diagram 19 where A = B. Here in diagram 21 the equation x=y for the general case BRM yields a different path because the initial values of "A" and "B" are not equal. Hence the line defining the gravitational neutral zone is a curve which is biased toward the smaller mass and intersects the D segment at a location where the segments on either side are in the same proportion as the two masses. In this case 2:1. See diagrams 21-24. 2) That the underlying structure of electricity, magnetism and gravity is bi-radial. Deriving comparable field structures to the attraction and repulsion lines of force and a generalized inverse square equation directly from the bi-radial matrix from first principles supports this hypotheses. Here the BRM has 18 rays from pole A and 36 rays in pole B. As long as the ray numbers from each pole remain in the same proportion any given equation in the bi-radial matrix will define a set of nodes which fall along the same path. The distinction is in the sampling rate. This is an important feature of the bi-radial matrix. In a bi-radial matrix the equation x=(f) y will define a set of nodes which falls on the same path as long as the ratio between the ray numbers from each pole remain the same. The BRM describes the underlying structure of two interacting gravitational fields as bi-polar; and obeying an inverse square law over distance. That the fundamental structure of gravitational interactions between two finite masses is bi-polar places gravity on the same geometric footing as electromagnetism. This could point the way to unification of gravitation with electromagnetism. Electrical fields are atleast bi-polar with the positive and negative poles being assigned the variables Q1 and Q2 or + and -. ​The structure of two interacting gravitational fields is bi-polar where the two poles are the centers of the two masses M1 and M2. With only one pole and corresponding mass Newton's equation breaks down. There is no distance (D) in the denominator and only one mass in the numerator.The BRM is clearly is an appropriate geometric analogy for Newton's inverse square law of gravitation for two masses. Many researchers seek a common system or structure which is consistent with known physical properties from the microscopic to the macroscopic scale. Ruacher et al have proposed a universal scaling law. Conformal field theories have similar properties of invariance. Earlier pioneers including Einstein and Weyl proposed classical unified field theories which attempted to find a common expression for quantum physics and general relativity (microscopic vs macroscopic) and to unify gravitation with electromagnetism. It is known that the atomic and sub-atomic forces are much stronger and exert over minute distances. It is known that gravity is much weaker and exerts over vast distances. Finding a single internally consistent geometric structure which serves as a complete analogy and description of both these conditions has been elusive. Recently a greater interest in detailed geometrical scaling models has emerged in the technical literature. Diagram 25 depicts a bi-radial interference pattern where the number of rays is small and the distance between A and B is extremely short. ​Connecting the nodes in diagram 26 forms the attraction lines. While the smaller ray numbers from each pole tends to increase the spacing between the nodes and the resulting attraction lines and lower the density of the field, as the distance decreases to the atomic and sub-atomic scale the distance factor supersedes the ray number factor and the resulting field is highly concentrated yet only exists over a small region. This is the same property of atomic and sub-atomic forces. While a larger ray number count from both poles corresponding to larger masses tends to increase the population density of the fields lines and nodes within the matrix corresponding to a stronger field, when the distance between the two poles becomes astronomical in scale (note shown) the distance factor supersedes the ray number factor and lowers the density of the field in the interaction region while the field extends over a vast distance. This is completely analogous with and corresponds to gravity. Notice with the higher ray count from poles A and B there is a finer interference pattern which is not decipherable with lower ray numbers. Isolating the nodes in diagram 28 we see there are seemingly hyperbolic lines which intersect the D segment between the two poles along with a vertical axis bisecting the D segment. The equations of these lines are easily derived from the matrix. See below. The intervals at which the hyperbolic and asymptotic curves approach the D segment correspond to the harmonic series within visual tolerances as shown in diagram 29. The underlying near harmonic structure of the bi-radial matrix is consistent with known properties of atoms: "The realization that atoms are vibrating in motions that are nearly harmonic is essential for understanding many properties of matter including molecular spectra, heat capacity and heat conduction." The near harmonic vibration of atoms can be attributed to their near harmonic structure. Is there a mathematical equation from the Bi-Radial matrix which can confirm this? To do so we need to view a bi-radial matrix with a lower ray sampling rate. Also note in the "Equations and Proofs" section there is the Cartesian based equation describing one of these curves. Notice in diagram 30 the set of "S" segments. This is a different set than the previous set of "R" segments used in the Bi-radial inverse square equation. Here the "S" segments have their origin at "A". There is a similar mirror set of "S" segments whose origin is at "B". spatial linear sections are the ratios of the harmonic series: 1, 1/2, 1/3, 1/4... When A≠B as A and B approach infinity a whole range of variations to the harmonic series result requiring separate analyses. Section 3 Analyzing the harmonic field structure of the bi-radial matrix. The hyperbolas pass through unique sets of nodes. The coordinates within each pairing relate to the harmonic overtone series or their reciprocals. For any given coordinate located on a hyperbola (x,y) the ratio x/(x+y) yields either a harmonic ratio or its reciprocal and indicates the portion of the D segment that hyperbola approaches. For example applying the formula x/(x+y) to the coordinate (8,4) yields the ratio 8/(8+4) or 2/3. 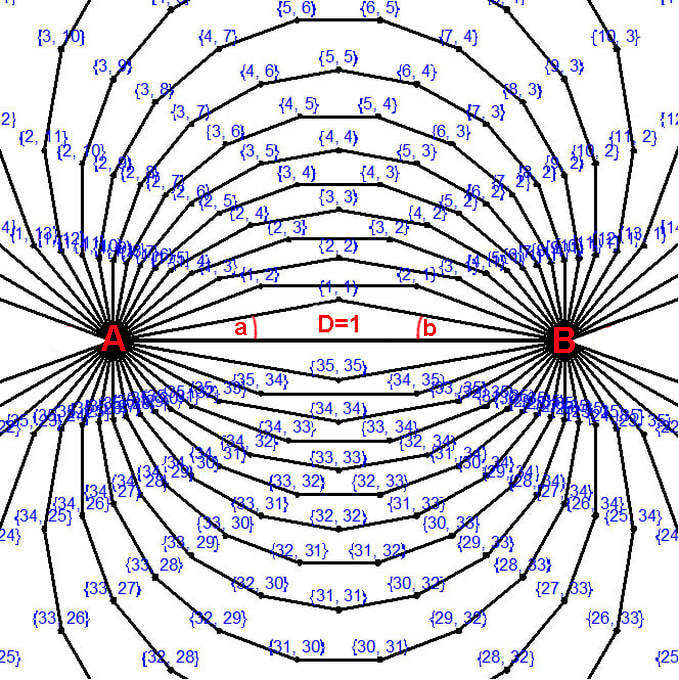 If we start at pole "B" the hyperbola which passes through (8,4) approaches the D segment at 2/3 of its length. As previously indicated It turns out that that the quotient of the coordinates along the hyperbolas yields a constant. To verify these curves are (asymptotic) hyperbolas a Cartesian equivalent is described in the equations and proofs section. The hyperbolas pass through unique sets of nodes. The ratios of the of the coordinates within each pairing relate to the harmonic overtone series or their reciprocals. This is completely analogous to the D segment being a vibrating string of unit length and the various sub-divisions and coordinate pairings representing the harmonic overtones. See Part 9 section 5 reviewing harmonic coordinate conditions. See part 9 section 3 for comparison to string theory. 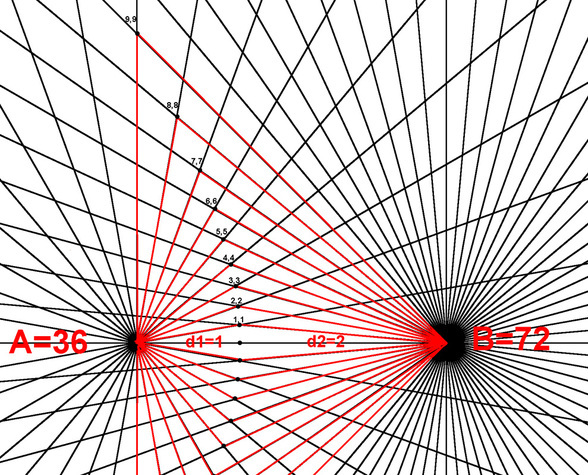 Diagram 32 shows a BRM with high number of rays relative to the distance between the poles "A" and "B" which approaches zero (singularity). 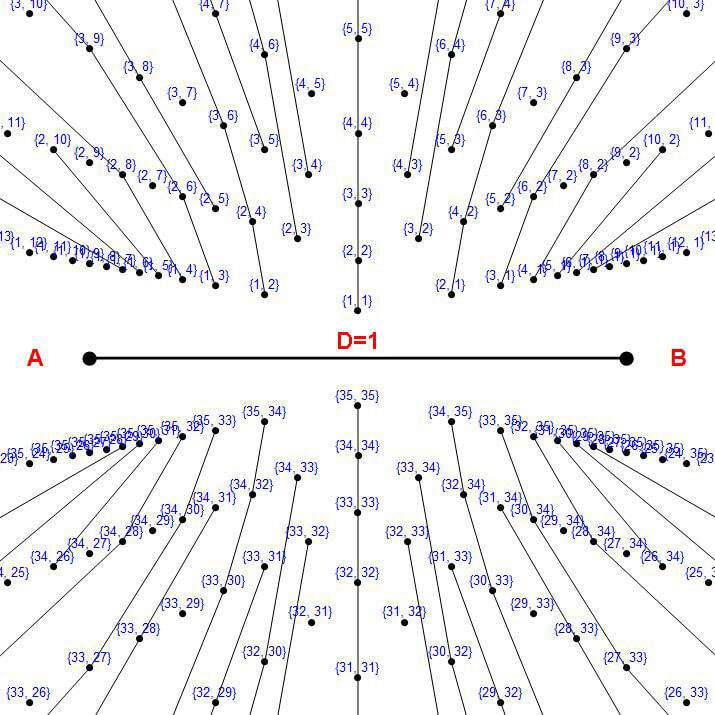 Notice the attraction lines in relationship to the two sets of equi-spaced radial lines.The harmonic structure which is detailed in diagram 30 is less obvious and still present even as the distance between the poles approaches zero. See part 9 section 8. "...My idea is to try to reformulate" physical laws so that they may be expressed entirely in terms of quantities which are discrete according to quantum physics. These reformulated" laws would, hopefully, be expressible entirely in combinatorial terms, even though they would be essentially re-expressing the content of conventional quantum theory, of space-time theory and, perhaps, of other aspects of physics as well. Thus, the quantum theory and space-time theory would be expected to arise together, out of some more primitive combinatorial theory..."
The BRM has basic components of lines and angles representing space and time which combine in various ways to form fundamental field structures from which fundamental equations directly emerge. This certainly has the properties of a more "primitive combinatorial theory" giving rise to fundamental symmetries, harmonic and inverse square relationships consistent with known physical laws. "...But why exactly does matter have to be introduced explicitly at all? It has been the assumption of traditional physics that even though gravity can be represented in terms of properties of space, other elements of our universe cannot. But in my approach everything just emerges from the same underlying network- or in effect from the structure of space..."
" The full mathematical structure of quantum field theory is far from completely worked out. But the basic notion is that for each possible type of particle there is some kind of continuous field that exists through out space-with the presence of a particle corresponding to a simple type of structure in this field." "...But now instead of defining constraints just in space, the laws of physics can be thought of as defining constraints on what can happen in both space and time....Just as for space it is my strong belief that time is fundamentally discrete..."
The bi-radial matrix represents an underlying structure which is consistent with these descriptions and more correlations are emerging from the present investigation. A further generalization of the BRM involving N-poles gives a more detailed description of atomic structure "...defining constraints on what can happen in both space and time." The BRM is a logical out growth of the general inverse square law relating to surface area of a sphere compared to its radius.. It is similar in that it is of purely geometric origin and shows close parallels to physical phenomenon. Where as the general inverse square law applies to single point source phenomenon such as a point source of light or a single gravitational mass, the BRM applies to bi-polar systems and two body systems. Further extensions of the BRM with multiple poles can apply to the many body and n-body problems. Just as mathematical inverse square relationship over distance is derived from the expanding sphere model relating its surface area to its radius with numerous parallels in physics, another mathematical inverse square relationship over distance is derived directly from the BRM symmetry with wide applications in physics most notably in the analysis of complex field structures. The BRM uses geometric and numerical methods to describe the reciprocal relation between space and time. It is revealing to view this reciprocal space time relationship as analogous to the reciprocal relation between the counting numbers and the harmonic series as previously shown in the detailed BRM diagrams. Harmonics is a vast field of study covering a wide range of phenomenon from music to physics to plant morphology. Here we are concerned with a particular aspect relating to the properties of a vibrating string. ﻿This basic algorithm which illustrates divisibility and a reflective symmetrical structure of the counting numbers also illustrates how counting numbers parallel the reciprocal harmonic relation between space and time. When sampling the two (2) column sequentially starting at one (1) a white square occurs every two spaces 2(S) and thus occurs one half of the time 1/2(T). 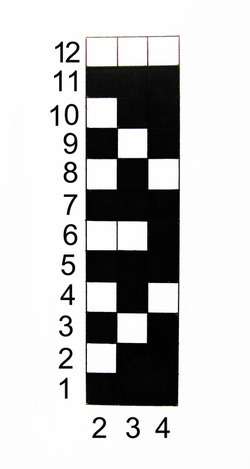 When sampling the three (3) column sequentially starting at one (1) a white square occurs every three spaces (3S) and thus occurs one third of the time 1/3(T). When sampling the four (4) column sequentially starting from one (1) a white square occurs every four spaces (4S) and thus occurs one fourth of the time 1/4(T). ﻿A number of coordinate systems are presently used in physics the most prevalent being the Cartesian coordinate system with variations to include a fourth time coordinate. Other coordinate systems with multiple origins including the bi-radial matrix are more revealing in cases where the underlying symmetry of the phenomenon corresponds to the symmetry of the coordinate system. This is the case with the bi-radial coordinate system with respect to two interacting gravitational fields and magnetism where the bi-polar symmetry of the respective forces correspond to the A and B origins of the BRM. This also greatly simplifies the attendant mathematics. The BRM gives rise to a harmonic coordinate system. This is worth considering in light of the harmonic coordinate condition which is among several coordinate conditions used in general relativity to solve the Einstein field equations. "Bohm argued the Cartesian order was incompatible with the new insights into quantum theory. The Cartesian grid is abstract and arbitrary; has no deep ontological connection with the quantum world. Moreover, he said, it assumes the existence of infinitesimal points within a continuous, infinitely divisible space. This assumption is incompatible with the basic insights into quantum theory, in which the notion of space breaks down long before the domain of the dimensionless point is reached. A revolution has occurred in physics, but at a deeper level the same order has prevailed. The new wine of quantum theory has merely been put in the old bottles of the Cartesian order." The Cartesian coordinate system lends itself to a background dependent view of physics which has long since been superseded by both relativity, and subsequent theories and models. As indicated previously there is a companion matrix which has inverse properties to the bi-radial matrix which can be adapted to yet another alternative coordinate system and is more suited than the bi-radial matrix for other experimental and observational scenarios including the Young double slit experiment. "In short, the spin network approach from loop quantum gravity shows spacetime as a series of pieces that are connected to each other. This can be visualized by dots (or nodes) representing the pieces of spacetime connected by lines - in other words, spacetime can be viewed as a network of quantum nodes. The smooth spacetime framework explicit in general relativity is what you see when you "zoom out" from the quantum scale up to the larger scale." While the BRM looks different than the spin-network diagrams devised by Penrose the similarities are telling. The description given of the spin network generally describes the BRM! As the number of rays from each pole in the bi-radial matrix approaches infinity, representing larger masses the line segments connecting the nodes and forming the field lines become shorter and shorter to the extent that the curvature appears more and more continuous. As the number of rays from each pole in the bi-radial matrix decreases corresponding to smaller masses the discrete quantized structure becomes more evident. The theory of loop quantum gravity, describes the fabric of space-time as an evolving spider's web of strands that carry information about the quantized areas and volumes of the regions they pass through. The individual strands of the web must eventually join their ends to form loops, hence the theory's name. Not to be confused with the much better known strings of string theory which move around in space-time. Strands actually are space-time: the information they carry defines the shape of the space-time fabric in their vicinity. Could the non-concentric circles in diagrams 12A and 12B correspond to these loops? One of the founders of Loop Quantum Gravity Lee Smolin has proposed in his recent book "Time Re-born"
﻿David Bohm et al have introduced the concept of the "quantum potential", "non-locality" and "The Implicate Order". Here we simply introduce a geometric representation of a quantum potential and define any set of equi-spaced radial lines as a quantum "time" potential. Axiom: time without space exists only as a potential. When a second time potential is in﻿troduced it creates a space "D" between them. See diagram 34. The bi-Radial matrix then is a useful model of "space-time". This indicates that gravitational and magnetic fields can be described in terms of interference patterns between two "quantum potentials". A more detailed treatment of this is beyond the scope of this introduction. Here the goal is to indicate the possible applications of the bi-radial matrix. Non-locality does have an expression in the BRM and this requires an additional variable (the phase relation) in order to be accurately described. This will be covered in future presentations. "The non-linear generation of harmonics in gravitational perturbations of black holes is explored using numerical relativity based on an in-going light-cone framework." "The Harmonic Structure of High-Frequency Quasi-periodic Oscillations in Accreting BlackHoles"
"Simulations of highly distorted black holes provide us with a suitable system to investigate the generation of nonlinear harmonics in black-hole oscillations." The BRM indicates a field structure that approaches the harmonic series as the ray numbers approach infinity, corresponding to larger mass. It is workable model on macroscopic scale in extreme gravity scenarios. ﻿As noted above Einstein, Weyl and others sought to unify Gravitation with electromagnetism. This was in pursuit of classical unified field theories. It is important to note that the reason the strong and weak forces were postulated was due to the fact that the atomic and sub-atomic forces were not obeying the inverse square relations as depicted in the fundamental force equations shown above. It was initially thought that subatomic forces could be accounted for with electromagnetism. This will be addressed in further presentations. Newton’s “superb theorem” for the gravitational 1/r2 force states that a spherically symmetric mass distribution attracts a body outside as if the entire mass were concentrated at the center. Since the entire mass is not at the center it is plausible that something else (likely more fundamental than mass) is the origin of gravitation. If mass were the origin of gravity the aforementioned spherically symmetric mass distribution ought to attract a body outside as if the entire mass was evenly distributed throughout the sphere as is the case, not as if the entire mass is concentrated at the center. 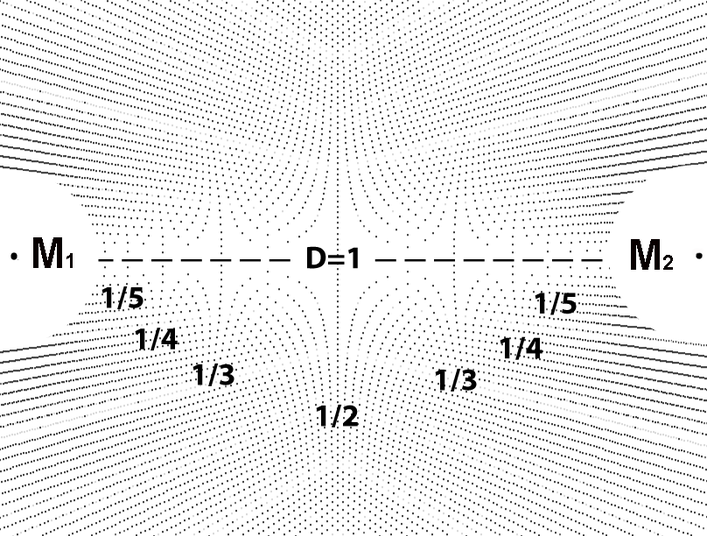 The equi-spaced radial lines associated with the expanding sphere model of the general inverse square law suggest an underlying structure for a single source gravitational field. The bi-radial and bi-concentric symmetry of the BRM provides the basis for explaining two interacting gravitational fields and implies a logical extension of Newton's superb theorem for two or more poles. Once on the Wolfram site follow the prompts to down load the CDF player. See diagram ﻿A bi-radial matrix was constructed as a logical extension to an existing model of gravitation. A bi-radial coordinate system was logically derived to facilitate further analysis. An interference pattern was formed from isolating the intersection nodes. A series of connection algorithms were implemented and fundamental attraction, repulsion and hyperbolic force field structures derived from first principles. Basic equations defining the lines of force were derived. A fundamental inverse square equation was derived directly from the underlying structure and is comparable to the three fundamental force equations of electricity, magnetism and gravitation. The bi-radial matrix is consistent and comparable with known physical interactions both structurally and mathematically. Properties of the matrix were introduced including invariance under spatial transformation which is consistent with conformal field theory and other proposed universal scaling mechanisms. Concurrent with the structural development definitions of space and time were advanced based on both practical observation and based on their being reciprocal aspects of motion. By developing the bi-radial matrix the geometric and numerical expression of this was shown to relate to the harmonic series and counting numbers. This is in pursuance to a quantum geometry based on "...combinatorial principles in terms of finite process such as counting or other basically simple manipulative procedures... ". A testable hypothesis regarding the gravitational equilibrium zone between two masses is arrived at from geometrical considerations. The BRM is revealing as a model of two interacting gravitational fields where the center of each mass are the respective "poles" of the combined field structure. This has similar properties to magnetism and electricity which both have opposite polarity. That a combined two body gravitational field , and electromagnetic fields have a bi-radial structure is supported by the current findings. Further the near harmonic structure of the BRM suggests relationships between the fundamental forces and harmonics. The bi-radial matrix provides a model of "force" expressed as a quantized harmonic interference pattern between to sets of quantum time potentials. It is useful as a model and coordinate system among several models including spin networks to aid in our understanding of space-time and fundamental forces. The mathematical relationships emerge directly from the geometry suggesting fundamental relationships of which our current physical laws are special cases. By using a bi-radial coordinate system much of the attendant mathematics is simplified indicating the utility of the BRM in computational science. ​ A further generalization and extension of the bi-radial matrix to describe N poles called the poly-radial matrix is under development. This allows detailed modelling of the N-body and many body problems including more detailed modelling of atomic structure. See diagram 36 below. Much work needs to be done to fully develop the BRM and companion matrices in connection with physics. If this is to be a viable model on the atomic scale can it arrive at the various atomic spectra from first principles for instance? From the current presentation there are strong indications this is possible. To be a viable model on the macroscopic scale are there other predictions which result from the matrix along with the gravitational equilibrium zone prediction? As indicated before there is a companion matrix to the bi-radial matrix with inverse properties with regards to space and time. ﻿Continuing gratitude and thanks to my long time friend and volunteer collaborator Bill Price for his broad contributions to this project including the original C++ program and help with the equations and proofs.. Thanks to my friends at the Foundation For New Directions in Cambridge, MA for their support and creating opportunities for me to disseminate this work at their various work shops and informal discussion groups. Thanks to the Wolfram Technical assistance team for help converting the original c++ code into Mathematica and enhancing the animation features.